Hello from Baltimore. It’s almost as pretty here as it is in Kings Canyon or Sequoia National Park, so I’m guessing Jim might be a little jealous right now, which may account for his apparent hurry to get out of there. Rosie Ruiz Skelding continues to fly along the trail, and on Tuesday (Day 14), he made it from 60 Lakes Basin. up and over Glen Pass, at 11,978 feet, and even though the highest pass is still to come, Glen Pass is the steepest and is reputed to be the most difficult. It is also supposed to have some of the most spectacular views on the trail. After climbing up and over Glen Pass, Jim would head down through Vidette Meadow and Bubbs Creek (with a view of Junction Peak) and back up to around 10,500 feet to camp at Center Basin Trail for his last night in Kings Canyon. On Wednesday Jim continued his climb up to Forester Pass, which is the highest pass on the John Muir Trail, at ~13,200 feet, and which marks the entry into the final section of the trail: Sequoia National Park. Adding further insult to the nearly 3,000-foot climb in three-and-a-half miles is the steep, rocky trail going back down. The south side of Forester Pass comprises a series of switchbacks cut into the rock that makes for a somewhat tricky descent, but that features some really beautiful views along the way. Tyndall Creek is at treeline, followed by Tawny Point, which has a panoramic view of the Great Western Divide (the range that blocks the view of Mt. Whitney from the west side of Sequoia). Just past Tawny Point is Bighorn Plateau, where Jim probably got his first good view of Mt. Whitney. Two big creek-crossings follow—Wright Creek and then Wallace Creek—and Jim set up camp near Wallace Creek on Wednesday evening, at the High Sierra Trail Junction, with more than 196 miles behind him. It looks as though he got an early start out of the Wallace Creek campground on Thursday morning, but then SPOT went quiet for most of the day. 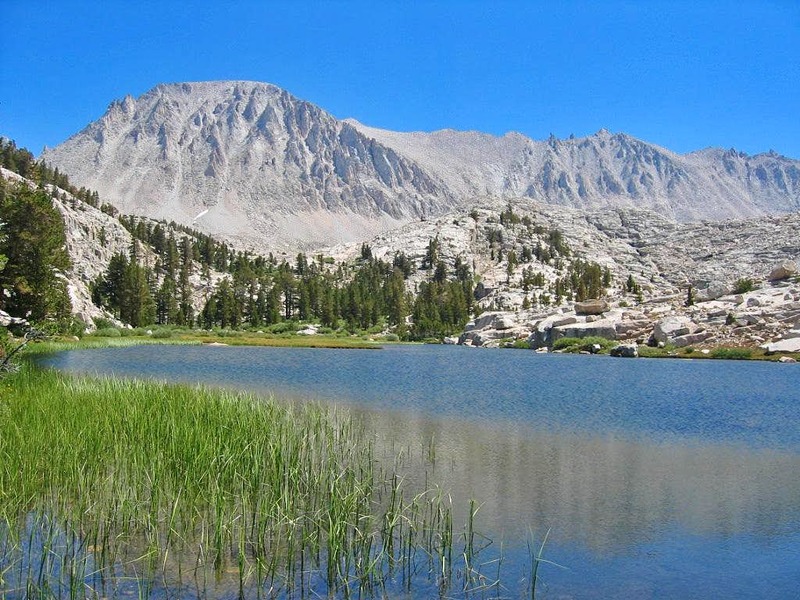 For many miles through Kings Canyon and Sequoia, the John Muir Trail and Pacific Crest Trail are one and the same, but at this point, the trails diverge, and JMT hikers make a hard left turn towards Mt. Whitney, while PCT hikers continue southbound (good idea for next trip: Canada to Mexico on the PCT?). Eddie and I were speculating that Jim might just head all the way up to the summit of Mt. Whitney today rather than stopping to camp at Guitar Lake, but at this point, he was already a day ahead of schedule, so a summit today would have made it two. Plus, it’s always nice to do an “alpine start” (except for the pitch-dark and freezing-cold parts), and get to the summit at sunrise. So it turned out to be a “short” mileage day, with Jim’s setting up camp at Guitar Lake early in the afternoon. Below is a view of Mt. Whitney from Timberline Lake, which is on the way to Guitar Lake. 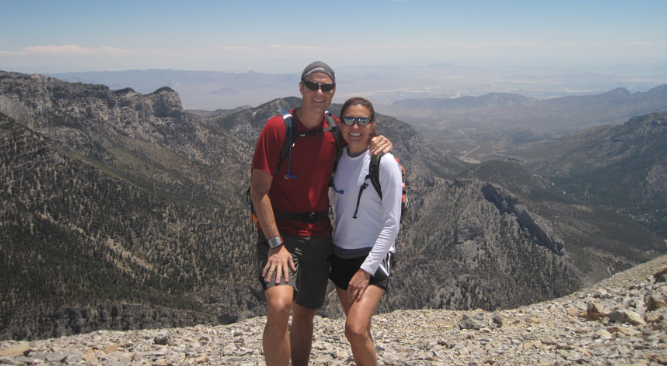 The JMT traverses that entire ridge to reach the summit. So, according to SPOT, Jim got to Guitar Lake around noon local time, and just hung out there for the rest of the day. Guitar Lake is the most popular “way station” on the approach to Mt. Whitney, and the last good place to restock with water, so I’m guessing there were lots of other skinny, bearded, less-than-fresh-smelling people with twice their normal allotments of red-blood-cells camping alongside him and getting ready to wake up in the wee hours to start their summit bids. Whitney ahoy. This entry was posted in JMT Trip on August 30, 2013 by admin.